VAN DER AA - [ Dedication page] From Beschryving van Spanjen en Portugaal. VAN DER AA,P. - [ Dedication page] From Beschryving van Spanjen en Portugaal. 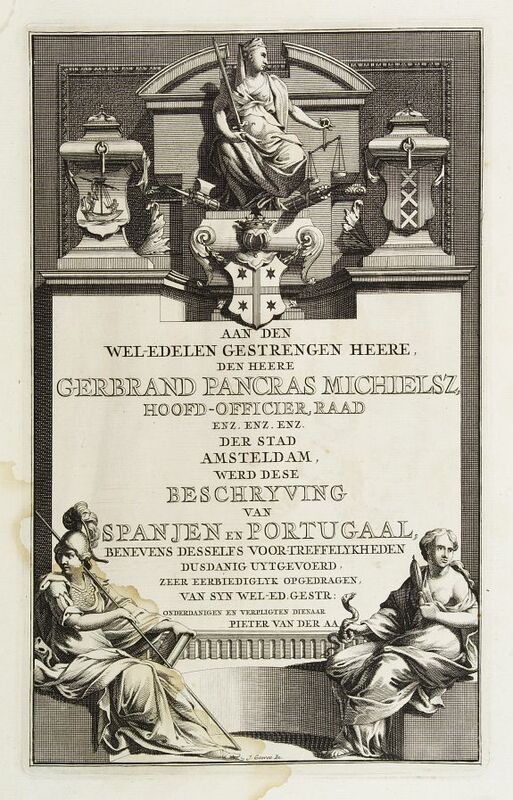 [ Dedication page] From Beschryving van Spanjen en Portugaal. - VAN DER AA,P. Title : [ Dedication page] From Beschryving van Spanjen en Portugaal..
Map maker : VAN DER AA,P.. Size : 10.6 x 6.5 inches. / 26.8 x 16.5 cm. Description :With a dedication to Mr. Gerbrand Pancras Michielsz. Design by J.Goeree. Showing architectual border with allegorical figures and in top coat of arms of Spain, and Amsterdam. Condition : Good and dark impression. Large water stain in the lower left corner. Marginal loss of paper in the upper left corner.